Kitchen countertop cleaning is my first concern as a mom of two and as a cook from scratch. You may think that I am very old fashion in the kitchen to hear the word scratch but healthy way of the cooking is the best for young children. I think, granite countertop is not a luxurious addition to my kitchen, it is a must. 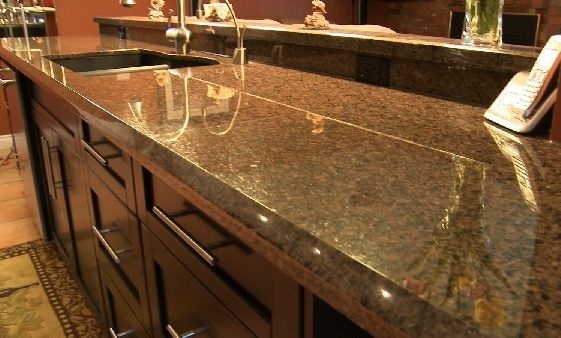 Granite’s natural beauty and durability make it a go to choice for many avid home cooks like me. The trusting natural material is also popular for families who know that life gets messy, and granite can handle the mess. There are some basics that all domestic consumers should keep in mind about the cleaning. Solace Home Design could be very helpful about the basics of caring and cleaning for a granite countertop. I would love to introduce you to a few of the best granite countertop-cleaning product in the market that are in my shopping list, too. 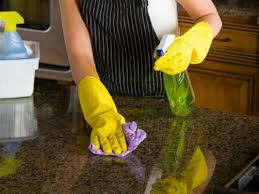 Kitchen countertop cleaning and protecting is a piece of cake if we compare with floor cleaning and house cleaning. The main reason of putting sealant is protection your beautiful stone from the staining. Shining of stone comes after. Mostly the detail-oriented companies put the first sealant, like a regulation, before or after installation of the granite countertops. So you need to repeat the process every year. Picture Credit: Cityhomegranitedepot. 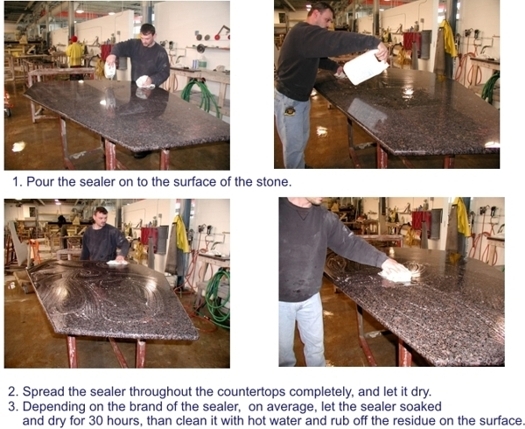 Sealing granite before installation by professionals. My first sealant has been purchased after a year of the installation date. Sealant can be found at many hardware stores. Sometimes your fabricator can sell the sealant products. My favorite is a DuPont brand sealant. It has fifteen years stain free warranty. But the Manufacturer is liable. Using a rough cloth, buff and polish the countertop when the sealant dries. Every countertop has some unfriendly foods. Acidic foods and oils make your Granite countertops unhappy and damage your sealant coat. If you avoid the preparation of acidic foods directly on them, they will serve you forever. The well-known acidic fruits are lime, lemon, grapefruits, and orange, cranberry and pomegranate, should be cut on cutting boards. Any juice spills should be immediately wiped up. Granite’s capacity to absorb is one of the key reasons that oils should not be applied directly to the surface. Any Oils, like olive oil, sesame oil, sunflower oil and canola oil, can soak into the stone, permanently staining it. Oil absorption is such a slow process over the time it cannot be seen in the first sight but it works like an acute disease. 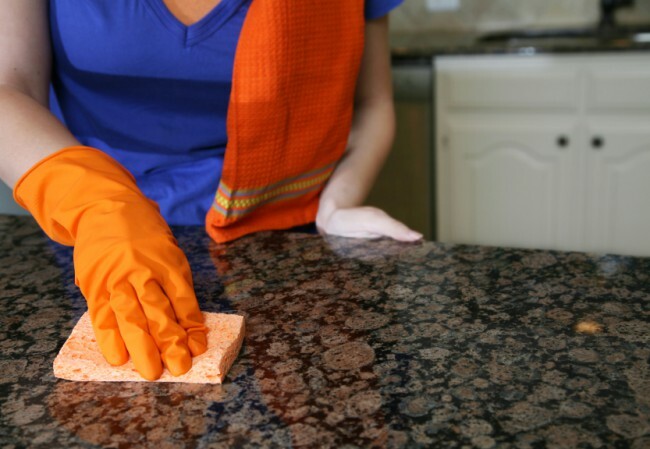 Kitchen countertop cleaning keeps actually your stone sanitized. It is good to know about the granite in kitchen countertop cleaning : The stain can be seen easily, if you have light color granite countertop. On the other hand, the dust and fingerprint can be seen easily on dark color countertop! In daily base cleaning, I recommend you using warm water and soap (Method Hand Soap), and then make sure to completely dry the countertop when you finish cleaning the countertop. Cleaning with a wet sponge, dishcloth, microfiber are good options. Since acid does not make your countertop happy, cleaners with acidic ingredients are not proper to use for your kitchen countertop cleaning. Never use citrus or vinegar based formulas to clean your countertops. The well-known Method cleaning brand offers a daily maintenance spray called The Daily Granite which is well-loved by homeowners. Another favorite is the Weiman brand line of granite countertop cleaners. If you like do it yourself project you can make your own liquid cleaner too. I might help you for this project by adding another article to my blog.